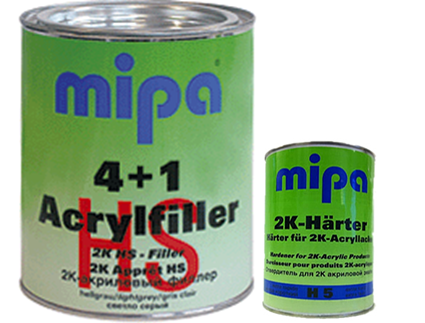 MIPA 4 + 1 Acrylfiller 2K HS HIgh Build Primer creates the perfect base for overpainting with topcoat. Its qualities include high build, fast drying, excellent sanding ability and has high solid content. Best results are obtained using MIPA H5 or H10 activator. This is supplied in 4 Litres with Activator. 4 Litre tins of this primer can also be bought from our site.